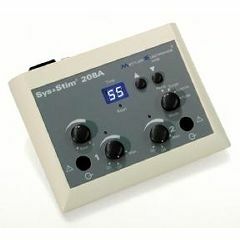 The Sys*Stim 208A is a two-channel stimulator with Surge, Pulse, Tetanize Reciprocation modes. It has easy-to-use knobs that control stimulation intensity and frequency, a digital timer and a remote patient cut-off switch. It is a small, portable stimulator with a professional and clinical appearance. I would like to know if this product comes with cables that work with it.